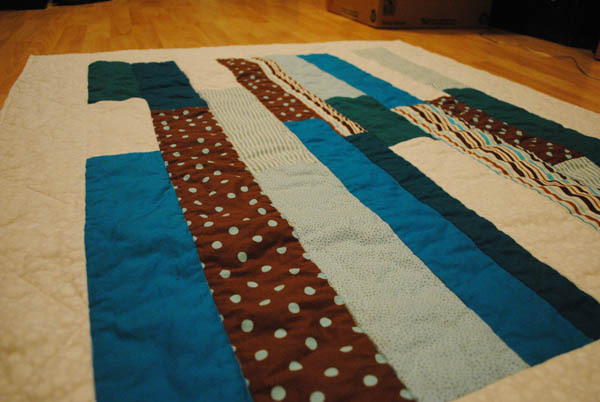 My cousin and his wife just added a little baby boy to their family, so for the baby shower I whipped up a baby quilt. 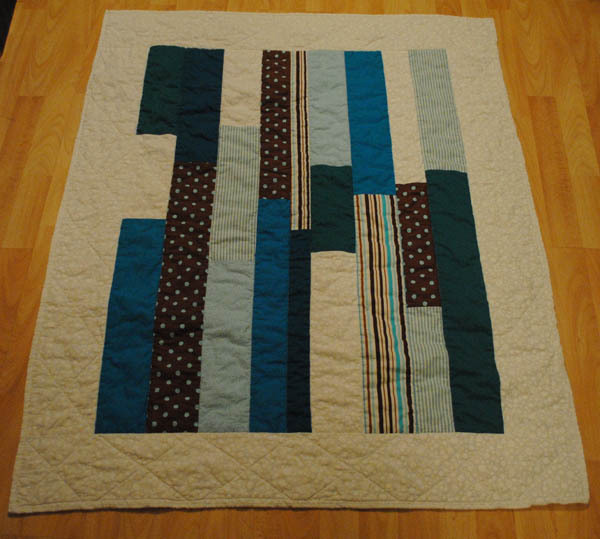 For those new to quilting, starting small is the way to go. 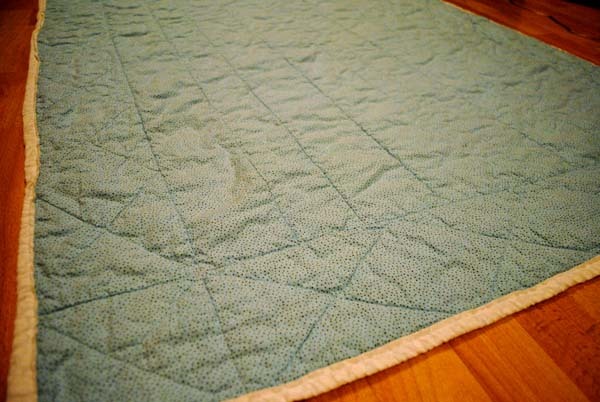 And I'm not sure I possess the required amount of patience for a large quilt. 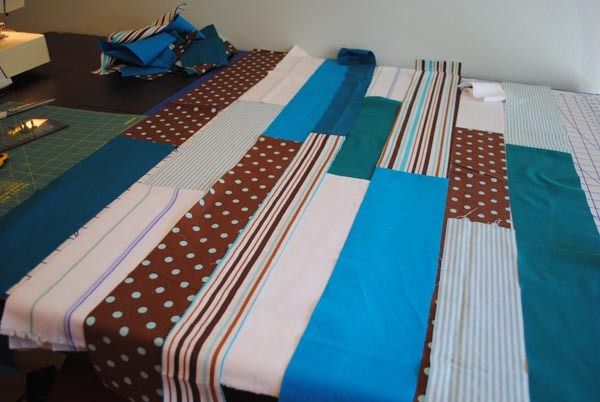 I started out looking through my fabric stash and found some browns, blues and teals with an overall theme of stripes and polka dots. For the quilt, I decided to incorporate a lot of white and the lighter colors rather than the standard pastel-for-babies route. Because I don't particularly like patterns, I just cut strips of varying widths and lengths. Then I started laying them out and playing around with the composition. 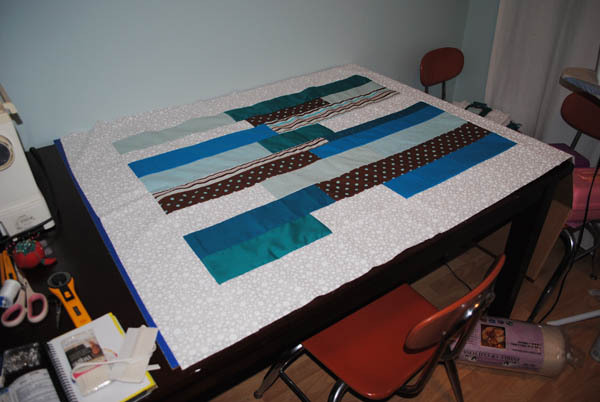 After sewing the strips together, I added a wide, white border to freshen it up. After layering the top with 80% cotton/20% polyester batting and the quilt back fabric, I planned out my stitching pattern. I simply 'stitched in the ditch' for the strips in the center, and for the border, I measured out large 'x's to go in the border. Then I bound the edges in crisp white to finish it off. You can see the stitching pattern a little bit better from the back as well. This quick and simple project was a great way to get me back into sewing. I haven't made anything in a while and it felt good to be back behind the machine.